Louise Mihailovic is a visual artist who is known for her pastel portraits. Louise tend to specialize in horses and dogs portrait but she has been known to do other pets on request. Louise is an international, multi winning artist. Her recent exhibition include Swan View Agriculture show, where she won three art categories. Louise grew up in rural part of UK. Moved to Perth in 2005 where her love of creating ar t took a whole new level. Louise now, is a full time artist. 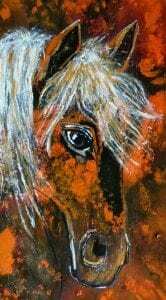 She formerly was a professional Three Day event competitor who represent the UK on several occasions, hence her love of drawing horses. 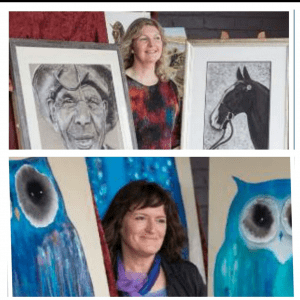 Louise travels the North suburbs of Perth delivering art workshops for all ages. She has recently branched out with doing Arty Partys for children birthday parties and community events. Please see her website, Facebook page for further information. 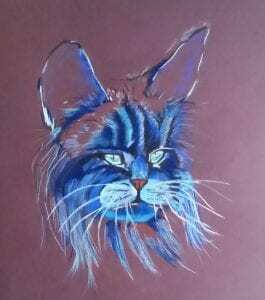 Louise concentrates my efforts in using pastel and acrylics. She loves to capture the animal’s personality. 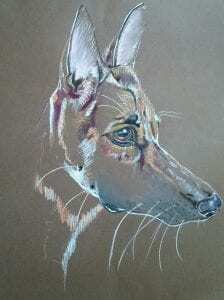 Louise says it as an honour and great pleasure to paint anybody special pet. Julie Sutherland is a visual Artist who is known for her Mixed Media Owl paintings and her Sea Inspired Paintings’ Julie has spent most of her life living in the Country areas of Western Australia. She enjoys waking up daily to the sound of Nature, Birds and Animals. Her Original Owl paintings are created from her love of Owls. Each painting that has been created is unique and one of a kind. Some were created to bring alot of colours into one painting. As each colour can evoke a emotion or feeling.